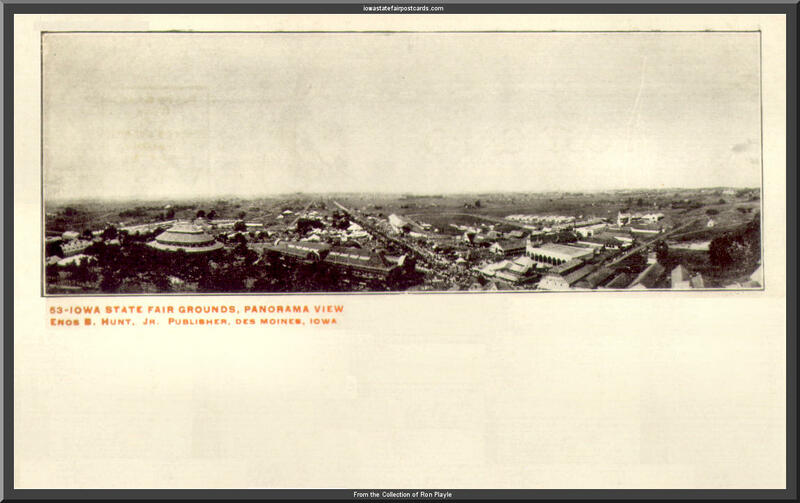 This photo shows the Knabenshue II at the Iowa State Fairgrounds, Des Moines, IA, in August, 1906. The man piloting the ship is Charles Hamilton. 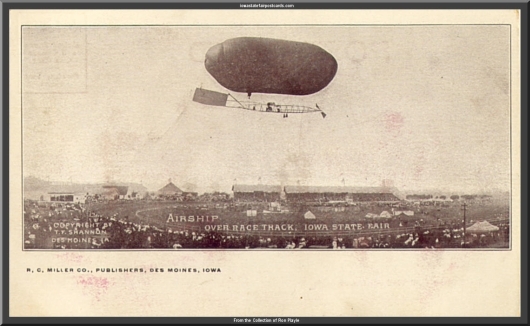 There are many postcards of this airship from its aerial demonstrations in Iowa but some identify it as the "No. 1" (it is not), or just say "unidentified". There is no information I could find on the construction of this airship! By 1905, Roy Knabenshue was already working on several projects, and was under the employ and management of Charles J. Strobel. 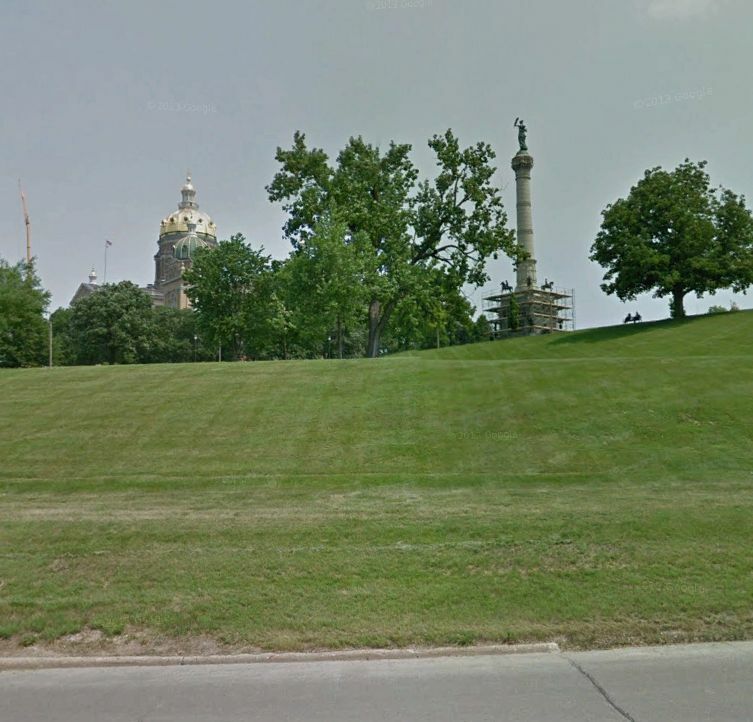 Fellow aviator, Lincoln Beachey, was also working with Roy Knabenshue, and in fact, was scheduled to join Knabenshue's manufacturing in Toledo assigned to re-furbish the Knabenshue Toledo No. 1. The Knabenshue Toledo No. 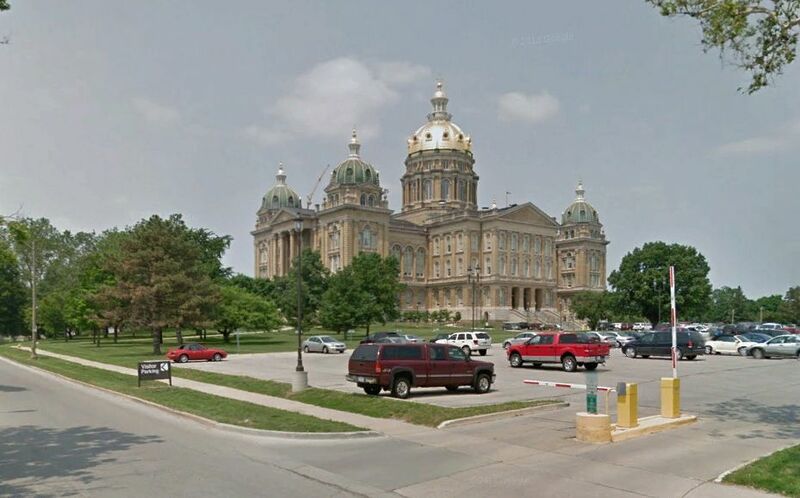 1 was built in late 1904 to early 1905, and is the subject of its own page on this site Knabenshue.html At the same time, Knabenshue also built his nearly identical "Toledo No. 2", which he flew in New York City in October, 1905. 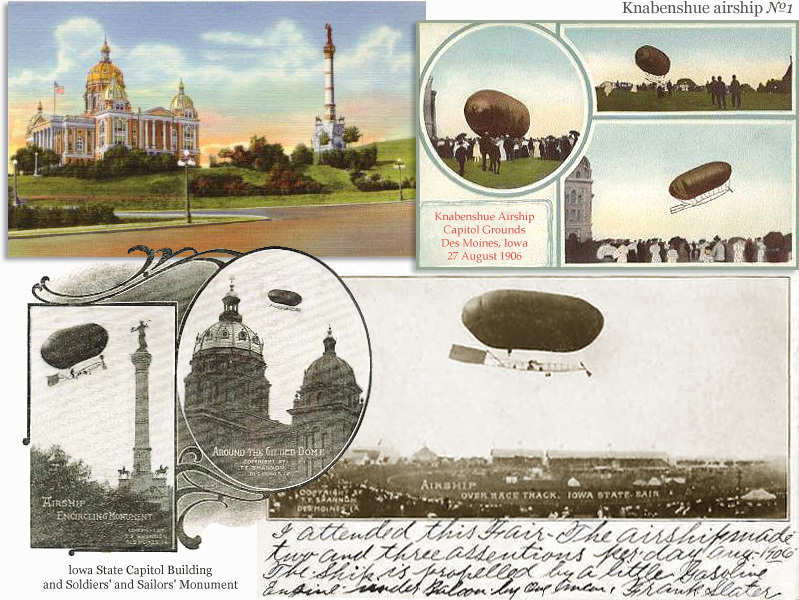 From that date on, confusion has reigned over the designation of the Knabenshue airships! Several subsequent Knabenshue designs are referred to in photographs as the "No. 2", and it is very hard to tell them apart. But the airship, the subject of this page, was not built till early, 1906, and I am calling it the "Knabenshue II", to separate it from the original "Toledo No. 2", and to use the designation already given this airship on the Rosebud's WWI and Early Aviation Image Archive. My evidence that this model is the Knabenshue II, comes from the December 21, 1905 issue of "The Motor Way" magazine. In it, it confirms that in late 1905, Roy Knabenshue was in California for the purpose of "constructing Toledo airship number, 2, which will be a vast improvement over the aeronaut's air vessel of the past season." The article goes on: "The gasoline engine will be differently located..."
Indeed, it is easy to see in the photographs shown here, the engine of this model is centrally located on the triangular "catwalk" frame and the frame itself is ~14 meters long, and the Gas Bag is decidedly different than the Knabenshue No. 1 and No. 2, which had a frame which measured 11.5 meters long. So this model matched the description in the 1905 magazine article, the date of which is well after the original Toledo No. 2 was already in operation. * Identifying the Knabenshue airships is difficult. 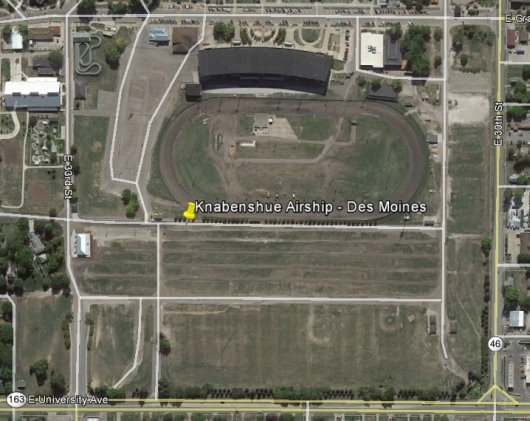 I'm using the "Knabenshue II" designation used by Rod Filan of the Rosebud's Early Aviation Archive at http://www.earlyaeroplanes.com. This airship is typically simply called an "unnamed Knabenshue". The Knabenshue II was a "exhibition" airship. Roy Knabenshue had an honest, good business going here. He would "book" his airship at various activities, ship by rail one of his airships to an advanced location, then arrive in time to set it up and fly it to the amazement of the paying audience. Such was the "operation" of this sort of aerial activity. Soon, the "barnstorming" heavier-than-air airplanes would be doing the same thing and would supplant the airship which was, at this time, a complete novelty. Hundreds of thousands would come out to see the Knabenshue airships. It is estimated that in the 1917 time frame the US population was about 90 million. In the period when Roy Knabenshue was active in his airship exhibitions since 1904 that 17 million had come out to see him and his airships! That's almost 19% of the population in a time before any commercial radio, TV, or modern high-speed social media! The fate of the Knabenshue II is a mystery. This researcher found no source which identified an accident or an incident which led to this airship terminating operations. By 1909, public interests in airships waned as airplanes were becoming all the rage. Knabenshue himself went to work for the Wright Brothers a planner for their "Wright Flier" exhibitions. In 1912 Knabenshue returned to airship work and attempted to start a dirigible passenger flight service in Pasadena, California. 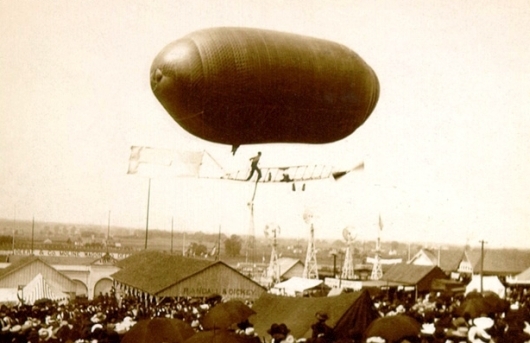 In 1914 he flew his dirigible Pasadena, renamed "White City" over Chicago. This ship made history in 1913 and 1914 by doing aerial sightseeing over the Middle West. During World War I, Knabenshue built observation balloons for the Army. Later, he worked for the National Park Service till he retired in 1944, and spent the next 10 years or so doing odd jobs helping recondition aircraft. Augustus Roy Knabenshue held Balloon License Number 31, Dirigible License Number 4, built ten airships and numerous balloons, was a prominent member of the Early Birds and had earned a significant place in American aviation history. He died on March 6th, 1960, nearly destitute, living on a meager pension income. Here is a shot of the Knabenshue II over the fairgrounds in Des Moines, Iowa in 1906. This is a sample of the postcard from the time, this one found on iowastatefairpostcards.com.